I’ve mostly been an EMG pickup user over the last 5-6 years. I decided that when I got my Ibanez 20th Ann RG550RFR that I wanted to load up some passive DiMarzios for something different. I started off with a DiMarzio PAF Pro in the bridge position, and whilst I liked the tone, it just didn’t hit my amp hard enough to get the crunch I wanted. I tried some magnet swaps to get a little more out of it, but it just never made the mark. That was OK though, as I could try it in the neck position. I had been reading of a number of people playing Tone Zones in their basswood-bodied Ibanez RGs and thought I should give it a go. I tracked a second hand one down and it arrived this week. Upon installation it just blew me away with the power it had. I loved the mid-range and highs that the pickup had, and it hit my amp just the way I wanted it to. The only issue I’m having currently is trying to tame the infamous monstrous low-end that the pickup has. It does sound amazing when playing on the A string and higher, but notes on the low E are just a little too fat for my liking. I will be playing with it a bit more over the next week or so, trying parallel wiring, maybe changing the magnet, or performing the half-air mod. I’ll be reviewing the Tone Zone here soon, and I will also update my PAF Pro review based on it’s use in the neck position. 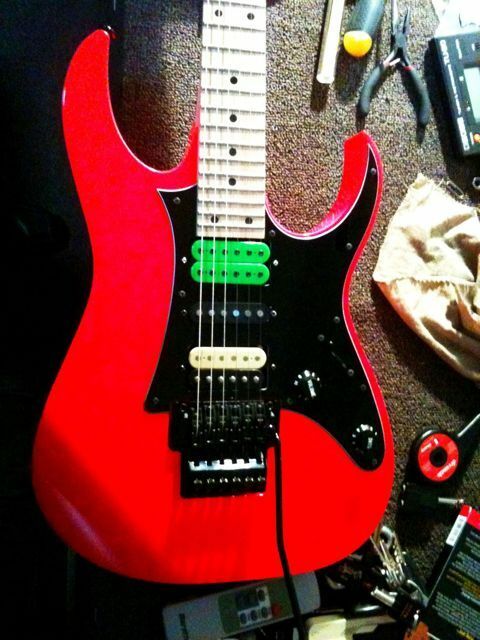 2 Responses to "Ibanez RG550RFR – new pickup install"
I had the Tone Zone in my Ibanez RGT42fm which has a mahogany body. Needless to say the low end pickup was a bad match for the guitar wood. I had a JEM Jr with Evolutions and they were awesome. I also used EMG’s which I got bored with the sterile sound. Now I’m using Duncan Blackouts which are a decent balance between the active & passive sound. I’d like to switch back to passives at some point but most of what people recommend for Ibanez are based on the basswood body most of them have. Matching Dimarzio’s to mahogany doesn’t seem to be so easy. I’ll probably buy another guitar for a different sound. Have you thought about installing a DiMarzio D Activator? That would probably sit really nicely in a Mahogany body. Tone Zone would probably be a bit too bassy, even after lowering the pickup and raising the pole-pieces to enhance the treble and reduce the bass.